What is a mommy-and-me music class like, anyway? Here are some video clips that will help give you an idea of what Music Together is all about, and why thousands of Brooklyn families have joined us to sing, dance, and play instruments with their babies, toddlers, and preschoolers for nearly 20 years! What is Music Together all about? Hear what parents have to say about Music Together. A Music Together class in action! 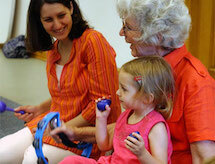 Family music-making continues all week long at home! Hear what Music Together Teachers have to say! Some information about "Music Together Big Kids" - for ages 5 - 7.